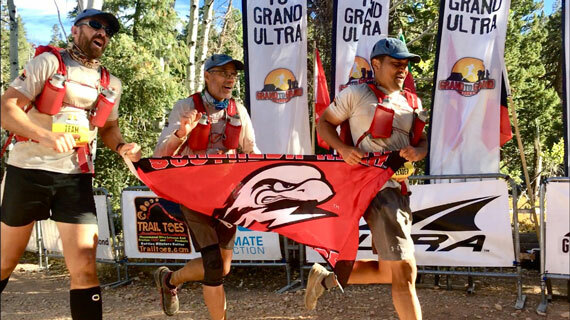 Placing first in the team division, Southern Utah University President Scott L Wyatt and professors William Heyborne and Johnny Oh are back from running the Grand to Grand Ultra Marathon. Over the course of six stages, the SUU for Hope team traveled a total of 170 miles and more than 400,000 steps, with runners from 22 countries. Starting at the North Rim of the Grand Canyon, the ultramarathon included seven days of traveling through the high desert, slot canyons, national forests and some of the most remote country in the United States. Stages varied in distance from 8 miles to 53 miles and overnight camps were built along the way. The Grand to Grand Ultra race is the adventure of a lifetime and the first self-supported stage footrace ever to take place in the U.S., meaning that each racer was responsible to carry all equipment, clothing, and food necessary for the seven days. Running for the future Sorenson Legacy Foundation Child and Family Development Center, the SUU for Hope team aimed to raise awareness and support for the project. As a commitment to the retention and graduation of SUU students, the center will provide a high-quality facility offering on-campus childcare and parent and family support. To date, SUU has raised about $1.3 million for the center. SUU students, under the direction of Professor of Communication Jon Smith, followed the team throughout the week-long adventure and are producing a documentary highlighting the journey. “Running for Hope” will premiere December 3 at 7 p.m. in SUU’s Great Hall. The event will include question and answer sessions with the runners, SUU’s production crew, and the Sorenson Legacy Foundation Child and Family Development Center steering committee.